IMG_8547, originally uploaded by Mic2006. It should come as no surprise that an Ontario cave is cold and wet and smelly – so much so in fact that we have named a nearby sink “the stink sink”. Anyway, here is me crawling from the entrance of the cave, the snow is yet to fully melt on the nearby slopes, but when you find an undiscovered cave (undiscovered to cavers that is) you have no choice but to explore it. We only went in a short distance today as we need wetsuits, I believe we must have seen about 100 feet of tunnel. It gets more spacious once you pass the entrance and the tunnel meanders in a limestone bedding plane. By the gently curved roof, it would not be unreasonable to suspect that the passage had initially developed beneath the water table, and by the multitude of other nearby karst features you absolutely know that numerous other sinks will be linking up as you get deeper in. Looking over the hill above the cave we can only speculate the route of the underground passage, a nearby sink leads us to suspect the first part of the route, but after that who knows? Unlike the relatively predictable route of a joint oriented tunnel like my recent trip to the Casselman Cave, the bedding plane orientation (without joints thus far noticed) is a crap shoot. If this passage does not dip beneath the water table soon it will be a provincially significant find – it can only get larger. Not tio diverge, but check out my new book “Tamarindo; Crooked times in Costa Rica“. If you have read my first book Rockwatching, you will certainly want my second. Not being quite high enough to crawl on all fours I had to belly inch my way down this slope throgh numerous jagged glass obstacles that struck up through the rock. Down below the passage gets a little higher and in one spot there is a pretty sizeable fossilized sponge with a scallop scooped into it. The rock looks fractured and the passage wide, but down near the bottom of the slope it almost seems like the pool ahead is possibly in a joint. It is also possible to see the water worn walls of the passage, but I am sinking down into deep mud. old pics 117, originally uploaded by Mic2006. Not bad for Ontario eh? Beleive it or not this is a cave dig. The TCG and Ontario cave divers all worked on this project for a number of years. As you can see, it proogresed on through the winter. Generally speaking, at its lowest level the water was about knee deep when the pumps were running. As soon as the power stopped the pit began to quickly fill with icy water. That tube that looks like a fire hose hanging into the pit was connected to a suction nozzle that sucked up gravel, clay and dirty water which were dumped out in the adjacent field. 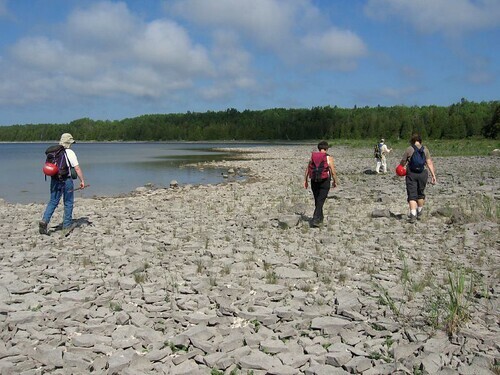 Many believe that this is a tunnel that had formed before the ice age in an area known as “The roof of Ontario”. It would appear that the exposed rock in the area had once been an active karst but as it was buried under clay it stopped developing. We found numerous large bones in this pit (ice age caribou amongst them), but inexplicably the project ground to a halt shortly after we reached the source of the water – an underwater tunnel. Does anyone know what kind of vertebrae this is? IMG_6953, originally uploaded by Mic2006. Shortly after descending the bone pit Greg found two beaver skulls in a corner and as I was walking I kicked something that made an oddly porcelean sound – very unlike the sound of the rock shards beneath my feet. 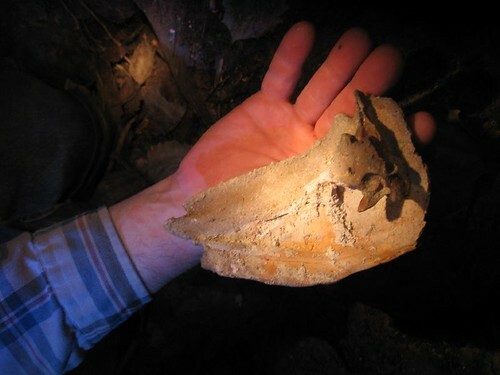 In examining the cave floor I found this broad plate-like piece of what I think was bone – a vertebrae fused to the inside of it. The plate was far thinner than the other bones and appeared to be partly stone in places or maybe it was just scaled over with flowstone. Some possibilities that came to mind – it is certainly from something larger than a beaver and with a thinner skull – someone suggested a deer ??? I will show the picture to my chiropractor this wednesday and see if the vertebrae look human. They have a model in the office that shows the lower lumbar – where my problem lies with all the nerves coming out. If it were human, might this be a burial site – or more likely just some unfortunate who had fallen down the shaft in the forest. I recall the bones – like water-logged slabs of wood – that we had pulled up from a sinkhole north of Orangeville. Buried deep in the glacially deposited clay and agregates we had exposed them with a sucking dredge and they turned out to be what was left of many ice-age caribou. I suppose a shaft that bells out at the bottom is a natural trap and anything that falls down there is unable to climb out. Fascinating! The debris is really deep on the floor – it would be an amazing place for an archaeologist to dig. IMG_6849, originally uploaded by Mic2006. Reaching the shore of this nameless – somewhat desolate looking patch of water we skirted around its edges until we found the caves. 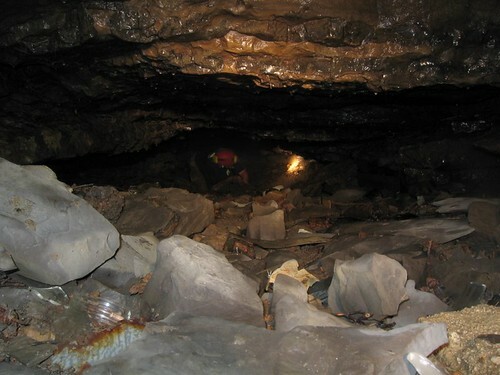 To any caver the rock – a shattered dolostone should suggest some promise – though the fractured nature of the material might also suggest a material that is to crumbly for the formation of cave tunnels. The ideal cave rock would be a nice thick strata of limestone. 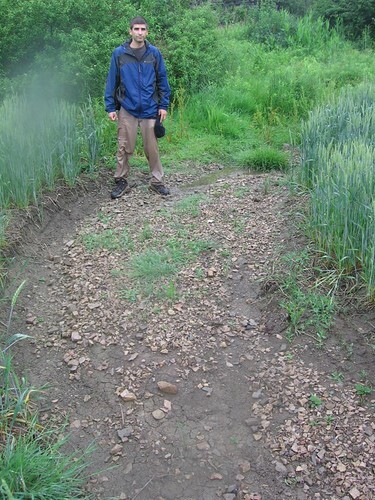 Dolostone is porus – like a sponge – and the water seeps through vugs and is not concentrated in any particular place. Limestone has a tight interlocking crystal structure and water only penetrates along joints and bedding planes. Thus tunnel formation will be concentrated along those arteries. If you know your local geology you will know the orientation of the local joint sets – the thickness of the bedding planes and the location of impermeable shale layers above which the water is concentrated. 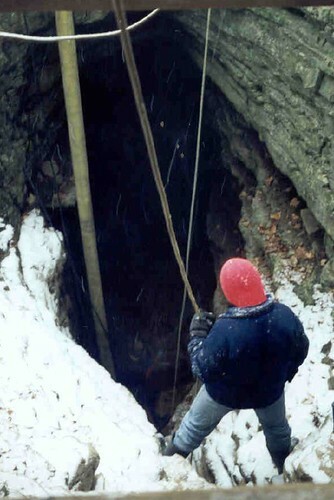 In short cave passages are somewhat predictable and this is the specialty of cave hunters.